The petitioner also sought orders on the Constitutionality or otherwise of financing political party primaries from the exchequer, the Constitutionality or otherwise of the time frames set for the necessary preparations for the elections – that is, party primaries,as well as the apparent failure to factor in the process of resolving disputes arising from party primaries, and whether or not the timelines laid down under The Elections (Amendments) Act, 2016 may lead to a candidate being denied the Constitutionally guaranteed right to participate in an election. In his ruling, delivered on February 16, 2017, Mativo J., sitting at the High Court, ruled that the Independent Electoral and Boundaries Commission (IEBC), while free to conduct party primaries, should not do so with funding from the exchequer or using public funds. He also ruled that, while the nomination period could disfranchise would-be candidates in the limited time available for the resolutions of disputes arising after the primaries, there was nothing in the law barring political parties from undertaking their primaries sufficiently early to enable IEBC to effectively carry on the election process. My bone of contention lies with the former, which gives rise to the following questions: Did the good judge err in law in determining that the Commission’s mandate to oversee party primaries extends to conducting these primaries? Does the ruling create a likelihood of bias in dispute resolution, thereby flying off the handle of the rule of law, presumption of justice and separation of powers? The problem can be debated either way. 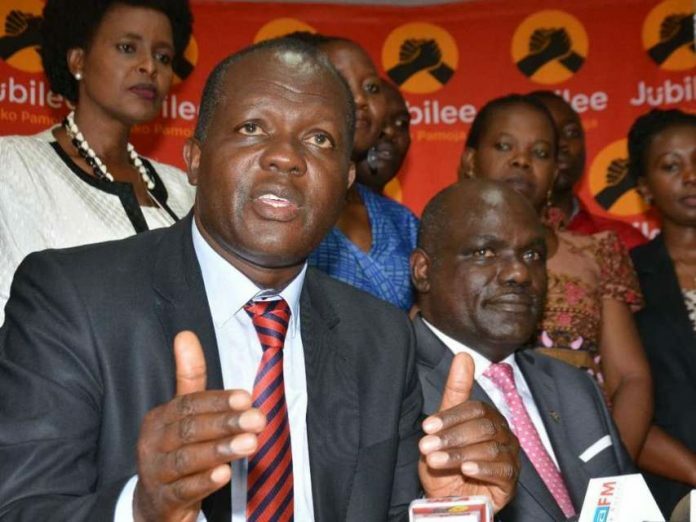 Walter Ochieng’ Khobe, a constitutional expert, agrees that nothing in the Constitution explicitly bars the IEBC from conducting such a poll and the Constitution envisages that by law the role in any other elections can be conferred. However for Khobe – and Dr Munabi Okubasu, a lecturer at the Kabarak School of Law) a more structured argument would be that that there are other provisions of the Constitution that envisage fairness in adjudication and thus where IEBC has a role in the adjudication then it cannot be involved in such elections. It is this view that I shall adopt in demonstrating that the judge was in fact in error. In arriving at his ruling, the judge addressed himself to the fundamentals of constitutional interpretation and sought to distinguish them from those guiding statutory interpretations. It was his concerted opinion that constitutions are documents sui generis to be interpreted according to principles suitable to their particular character, and not necessarily according to the ordinary rules and presumptions of statutory interpretation. He couldn’t be more correct. Statutes demand a stricter approach. They are prima facie constitutional with the will of the Legislature taking pre-eminence over other principles. As he observed, the starting point of interpreting a statute is the language itself. In the absence of an expressed legislative intention to the contrary, the language must ordinarily be taken as conclusive. Against this background, Article 88 (4) of the Constitution, which provides that the “The Commission is responsible for conducting for supervising referenda and elections to any elective body or office established by this Constitution, and any other elections as prescribed by an Act of Parliament and, in particular, for— (d) the regulation of the process by which parties nominate candidates for elections; (e) the settlement of electoral disputes, including disputes relating to or arising from nominations but excluding election petitions and disputes subsequent to the declaration of election results…” —was, according to him, clear and unambiguous. But is it? “…and any other elections as prescribed in an act of parliament and, in particular, for — (d) the regulation of the process by which parties nominate candidates for elections” should be considered in harmony with the rest of the Constitution and in context— by the pristine principle of noscitur a sociis, which the judge seems to be well aware of. How he quickly disfavours this route for a literal approach is therefore quite surprising. Though literal construction takes a prima facie preference in constitutional interpretation, to arrive at the real meaning, it is always necessary, to get an exact conception of the aim, scope and object of the whole constitution. Quoting the distinguished Professor and then President of the Supreme Court of Israel, Aharon Barak, David Feldman in Statutory Interpretation and Constitutional Legislation writes, unlike statutes which thrive on legislative intent and are much more straightforward, constitutional provisions are like parables, or morality tales. They tell a story about the state, paint a picture of its unity, and try to stimulate loyalty to it: and while they appear descriptive, in reality they present the State as the drafters would like it to be, not as it was and is. Therefore, no matter how straightforward its articles may seem, judges must resist the temptation of the easy acceptable route of literal definition. In this case, the intent of the constitution makers surely cannot be deciphered from reading of article 88 alone. We must consider an interpretation that promotes the values, purposes and principles of the Constitution, favours good governance, and advances the rule of law and human rights. As Mugambi Imanyara rightly argued, which was also the petitioners question in Kethi Kilonzo (supra), since the Commission is also mandated to hear and determine disputes arising from the nominations, it cannot competently resolve disputes arising from a process it has presided. There is a looming question of bias, which jeopardizes the right to fair hearing and the rule of law. Yet, the biggest problem with the judge’s interpretation of Article 88 is that it throws it (the article) into direct conflict with other articles of the Constitution particularly the right to fair hearing in Article 50 (1), the values and principles of governance under article 10, 159 (2)(e), and the Preamble, which recognises the essential values of the rule of law and human rights as bases of the Constitution. This brings into question the Constitutionality of Article 88. The unconstitutionality of an article of the Constitution is a rarity that can only arise from one of two happenings. It can either be as a result of procedural flaw in its creation through amendment (see the dictum of Justice Kato in Rwanyarare and Haj Badru Wegulo vs. Attorney General, Constitutional petition No. 5 of 1999), or because it goes against the grain of constitutional values and principles upon which the Constitution is built— what were severally referred to as superior constitutional norms in Kesavanada Bharati vs. State of Kerala and Anr. Curiously, the good judge disregards any of these possibilities in magnifying the problem to be that of the unconstitutionality of the entire Constitution instead. He then ventures into a long discourse on the improbability of unconstitutional constitutions— a matter that was not before the court in the first place! In conclusion, while text remains an important strand in legal interpretation, Interpreters must consider it in the light of constitutional principles, including prohibition of arbitrariness. Only then can a sensible, workable outcome to a dispute that is consistent with a legislative text be realised.